In Cleveland you can bet that snow can fall as early as mid-Ocotber but not this year! This was the first snow of the year in mid-November. Family pictures look great against the snowy backdrop. The beautiful simple white color makes everyone stand out and look ahhhmazing! I love it plus its a natural reflector which photographers love! The only catch is you have to be brave enough to stand a little chill. So far, we've been having a unusually warm winter so no worries there! This adorable family was such a pleasure to meet. Kelly found me on Facebook via a friend. I love to hear peoples stories of how they came across my work. I couldn't get enough of the cute big brother and little sister, they were so sweet to each other and full of happy giggles. I personally love the first image the most. It's the most authentic and true to this family-so joyful and full of love. I think we captured some beautiful photos which I'm sure will be treasured for a lifetime. It was so nice to meet you guys and hope to do this again! 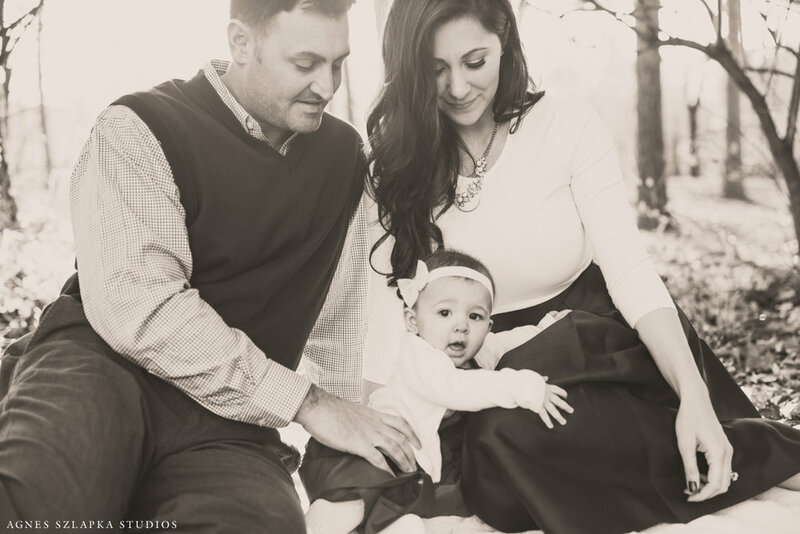 I met this sweet loving family for a holiday mini photo session last week of November. Cleveland, Ohio is know for crazy weather! Just the week prior to that we had snow on the ground and the week after we had an abundance of sunshine! Prior to the session, this gorgeous mommy said to me "I hope we don't look silly in our dressy outfits". Of course not, they looked fabulous! 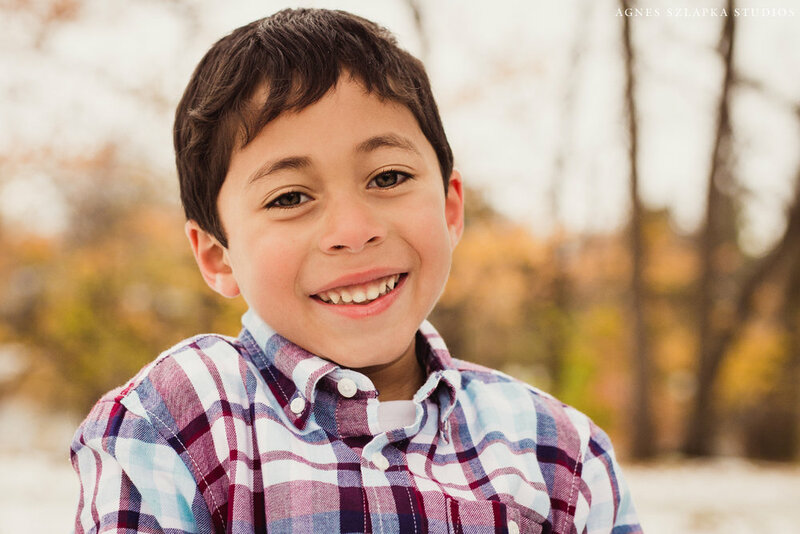 I absolutely love when my clients put in a lot of effort of their own to make my family photo sessions even a bigger success! Ladies, send your husbands to get haircuts, prepare them mentally, make them excited and plan their outfits in advance! Prepare yourselves as well. You don't want to be rushing to put something together because I know from personal experience many times that does not work. I will do my best as your photographer to make these photos the best they can be but your effort is also very important! We had a wonderful time capturing some quick family memories. The little nine month old girl was a complete star! She made these images so amazing and pure with her gentle smiles and beautiful big brown eyes! I especially love the last photo in this blog post. The way Daddy has his two girls wrapped in his arms, speaks volumes to me! He loves his wife so much and is already setting a tremendous example to his little girl and how she should be treated one day.... Love! Thank you guys for entrusting me to capture your memories! There is no doubt in my mind that the first hour after sunrise or an hour before sunset know as the "golden hour" are the best times to capture beautiful photographs! You know when you see a picture and your first reaction is just happy, warm and magical thoughts? It usually because of the light! The right stuff will make an ordinary picture into a spectacular image! Here are some of my favorite reasons why "golden light" rocks! It is So Soft and Smooth! Golden light will make everyone look amazing, harsh light will not. Mid-day sun is really my least favorite time to shoot. Soft light will make your skin look flawless and allow you to comfortably open your eyes without squinting. Golden Light is Warm. Do you like having a tan? Well, this is your hour! Your skin will look warm, healthy and have a beautiful natural glow. Golden Light is Dimensional. This hour will provide me with amazing dimension by being able to take advantage of great shadows. Images have more visual interest and magic! Lens Flare! This is a little trick photographers use. Adds some more magic and twinkle to your images. Sunbathing you in goodness! I hope I convinced you "golden hour" pictures are THE BEST! Of course, we don't always have the luxury of catching that amazing light. It may because of a cloudy day, strict schedules, nap times, bed times or other arrangements. But I know it is SO worth the wait or adjusting your child's nap time even if you think "it's just light". I promise you, you will not be disappointed! Every time I see pretty light before sunset, I think to myself: "this would make amazing pictures". It truly is the most beautiful time to capture amazing memories and precious moments. Here are some of my favorite "golden hour" photographs from previous clients. A continuation from the previous blog post only this time at home, sweet home. Like I wrote before, newborn photography sessions surely have a sweet spot in my heart. There is something so surreal and magical about these first few weeks as parents meet their little bundle of joy. The images naturally become full of raw emotion, uncensored love and feel so organic. 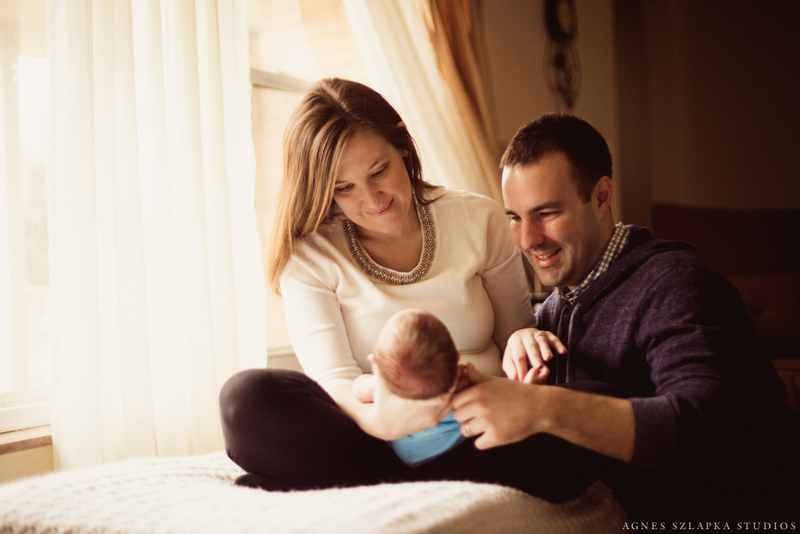 My approach to newborn photography is focused around these precious moments in a families life. 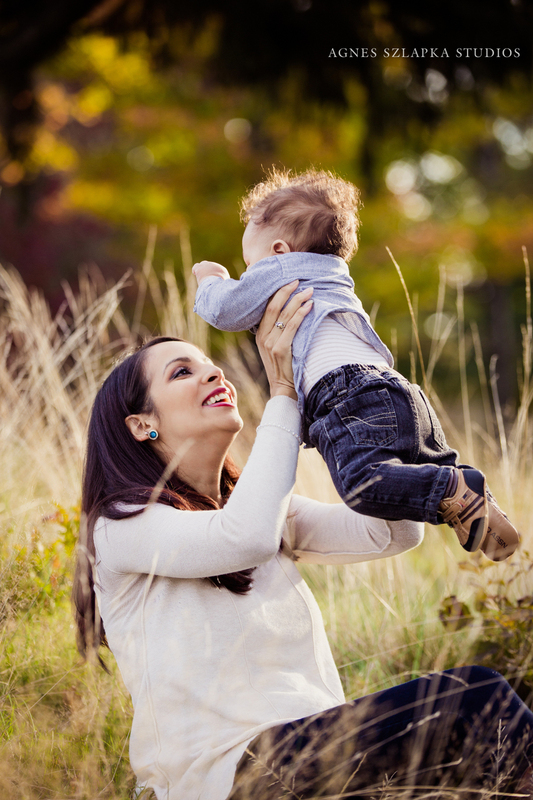 I tend to shy away from too many distracting props and unnatural poses as I feel it takes away from the beauty of the baby and the families nature. 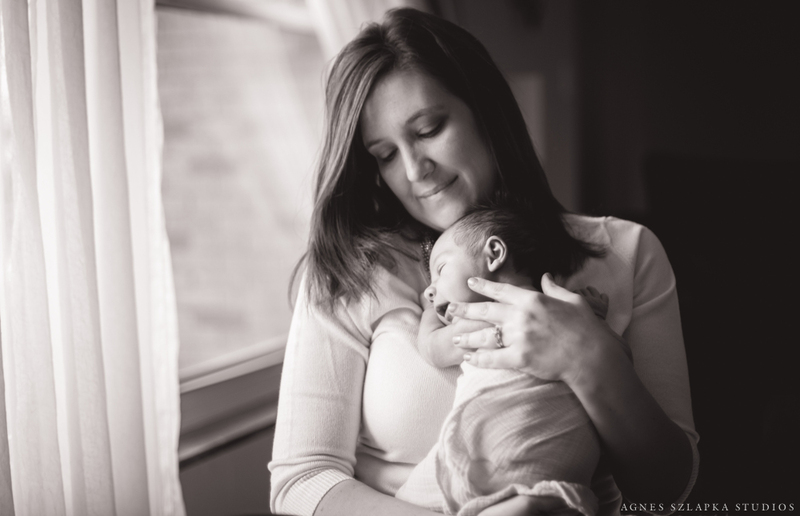 Lifestyle newborn photography is so beautiful and I hope to capture many, many more of these moments for other families. There was a little preparation involved in this Christmas photo session. We had to make some calls regarding use of the fireplace in Horseshoe Park, the mom bought a beautiful decorative banner that fit the scene perfectly (belongs to Agnes' Studios now) and then we actually had to light the fireplace on a very chilly day! Plus the usual preparation which is involved in every shoot - making everyone look good! This was a very quick session lasting about 15-20 mins. Once a toddler decides the shoot is over, it's over. But despite the lack of time, I was able to capture some amazing photographs that this family will cherish forever. Awesome! !